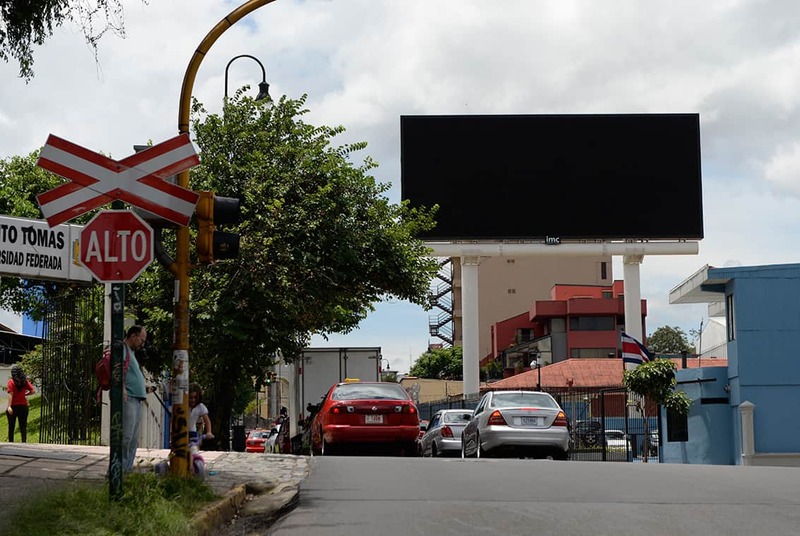 Three recent rulings issued by the Constitutional Chamber of the Supreme Court, or Sala IV, prompted the Public Works and Transport Ministry (MOPT) to turn off the lights on three electronic billboards along major roadways in the Costa Rican capital. MOPT last week told the National Power and Light Company to power down the billboards due to “visual pollution,” a phrase used in the Sala IV rulings. However, the ministry cannot order the billboards to be removed because they are located on private property. The LED screens belong to Interamericana Medios de Comunicación (IMC) and are located near Plaza del Sol Mall in Curridabat, east of San José, next to La Sabana Park, in western San José, and across the street from the National Museum in downtown San José. IMC representatives argued that MOPT had granted permission for them to install the billboards beginning in 2010, and that the company had been clear from the start that they were electronic devices. IMC said they may sue to turn the billboards back on, according to IMC legal adviser Jonathan Picado. In its rulings, the Sala IV evaluated reports by the University of Costa Rica’s National Structural Materials and Models Laboratory (LANAMME) that backed citizen complaints, according to Vinicio Barboza, head of MOPT’s Inspection and Demolition Department. Sala IV justices also noted that the country has no regulations governing these types of advertising devices, and until that happens, permits should not be granted for their use. “This office recommends, for the safety of motorists, a ban on these types of screens until technical criteria can be used to justify their approval or rejection,” the report added. The Sala IV’s decision, however, does not affect similar electronic screens used by the Roadway Safety Council to report accidents, traffic jams and other information along several highways, as justices considered these devices provide a public service to motorists. Barboza also said his department currently is conducting inspections of other electronic billboards, including those located near the Juan Santamaría International Airport in Alajuela, and others near the toll booth in Escazú, southwest of the capital.